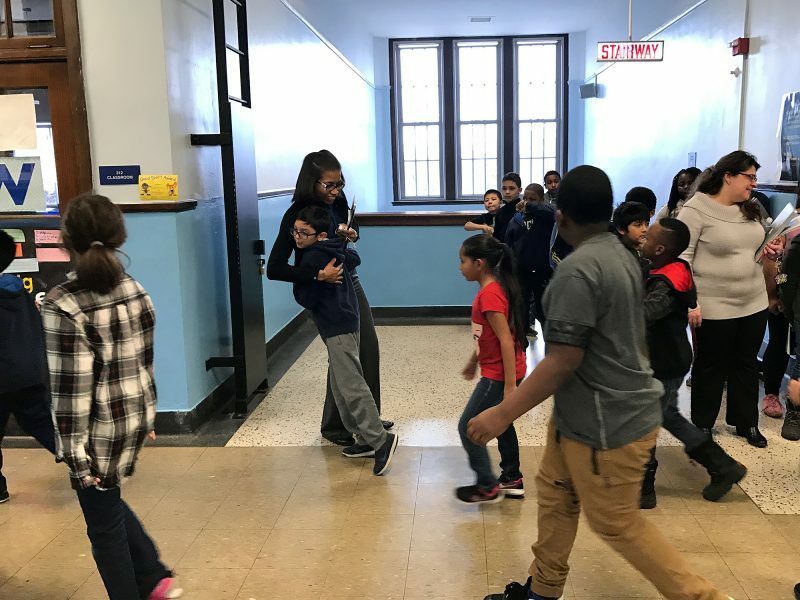 CHICAGO — Principal Macquline King-Morris stepped out of the way of two lines of students heading to the Courtenay Elementary Language Arts Center gym. But the stream of elementary school kids rerouted themselves to deliver hugs, high fives and huge grins. Creating a PK-8 school where every student feels welcome is at the top of King-Morris’ list of priorities. With a student population that is 48 percent black, 35 percent Hispanic, 9 percent white and 6 percent Asian, Courtenay is one of the most diverse schools in Chicago, a city known for its stark racial segregation, and King-Morris thinks about inclusivity a lot. King-Morris, who is black, places her own racial identity low on the list of qualities that make her a good school leader. Instead, she cites her 12 years of teaching, her rigorous principal training through the nonprofit New Leaders program, her propensity to foster teacher leadership and her willingness to listen. That may be true, but studies have shown that the race of educators does make a difference to minority students and their schools. Several studies have demonstrated pronounced benefits for black children with same-race teachers, ranging from better math performance to higher graduation rates. And although the body of research on the effects of same-race principals is still relatively small, it does point to black student benefits: for example, a national study published in the March 2017 Elementary School Journal found that black students are more likely to be recommended for gifted programs in schools that have a black principal. (That’s important because black students have been underrepresented in gifted programs for decades.) And numerous studies point to the benefits of diverse organizational leadership, including one by the consulting firm McKinsey showing that companies with diverse boards performed better than those with mostly white men on their boards. Yet in 2012 only about 10 percent of public school principals were black while 16 percent of public school students were black, according to a 2016 U.S. Department of Education report on diversity among educators. The same report showed that only 7 percent of principals were Hispanic compared to 24 percent of public school students. “We have got to be much more deliberate and intentional about building a diverse pipeline across the educational spectrum,” said Jean Desravines, CEO of New Leaders, which seeks to improve both the quality and the diversity of urban school leadership. New Leaders, with its Aspiring Principals program in six cities and the San Francisco Bay Area, is not the only nonprofit that has focused on this challenge, but its success has been notable. The program’s network of educators and district leaders recommend teachers who might be interested in pursuing school leadership via the summer training, monthly classes, paid principal apprenticeships and two additional years of professional support that New Leaders offers. Since its inception in 2001, New Leaders reports that 1,083 principals have successfully completed the program, 64 percent of whom are people of color — more than triple the national average. Desravines has a one-word answer to explain New Leaders’ success: mindset. Echoing King-Morris, he said the belief that all children can learn is the primary prerequisite for becoming a strong school leader. Race or ethnicity can help shape that belief, he added. Desravines argues that by focusing on mindset, a willingness to share leadership with other adults and a proven track record of success, his organization can do a better job of picking future leaders than if it stuck to traditional measures like GPAs and the relative prestige of candidates’ alma maters. The results of New Leaders’ selection process, Desravines said, are naturally diverse. Still, that diversity is necessarily limited by the lack of diversity in the teacher workforce — the primary talent pool for future school leaders. According to the 2016 report on diversity among educators, in 2012, only 7 percent of teachers were black, while 8 percent were Hispanic. 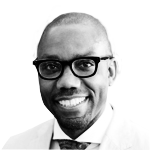 The current dearth of black educators, in particular, is not accidental, nor is it due to a historical reluctance on the part of black people to become teachers and principals. After the Civil War, the black community pushed hard and successfully to be better represented in the teaching force at the segregated schools that were open to black students. “The black principal was for years the linchpin of his community — the link between the white and black communities, the idol of ambitious young blacks, the recruiter and hirer of new black teachers,” said a 1970 report by the U.S. Department of Health, Education and Welfare. But, following the 1954 U.S. Supreme Court decision that outlawed school segregation by race, black principals, especially in the South, were routinely and systematically removed from their jobs. “Hundreds of [black educators] have been demoted, dismissed outright, denied new contracts or pressured into resigning, and the teachers hired to replace them include fewer and fewer blacks,” stated the 1970 report. Nearly 50 years later, the number of black and Hispanic educators has remained disproportionately low. However, there’s some evidence that change is coming. There were more black and Hispanic college students pursuing education majors in 2012 than in 2000, according to the 2016 diversity report. Twenty-seven percent of education majors in 2012 identified as black, Hispanic or “other,” compared to 22 percent in 2000. And 22 percent of new teachers in 2012 were black, Hispanic or “other” — four percentage points more diverse than the teaching workforce as a whole. Nonprofits and school districts across the country have been working to increase the diversity of school teachers and leaders. The public school system in Boston; Call Me MISTER in South Carolina; Dean’s Future Scholars in Reno, Nevada; Teach Tomorrow in Oakland, California; and Teach For America are just a few of the growing number of organizations focused on changing the make-up of the school workforce. Rejecting the notion that they would have to lower their standards to recruit a more diverse corps, the TFA recruitment team decided to broaden its definition of evidence that a given candidate had demonstrated leadership potential. Instead of asking only for the types of college clubs that candidates had led, for example, TFA asked if they had held down a job while in college and what they had learned from it. 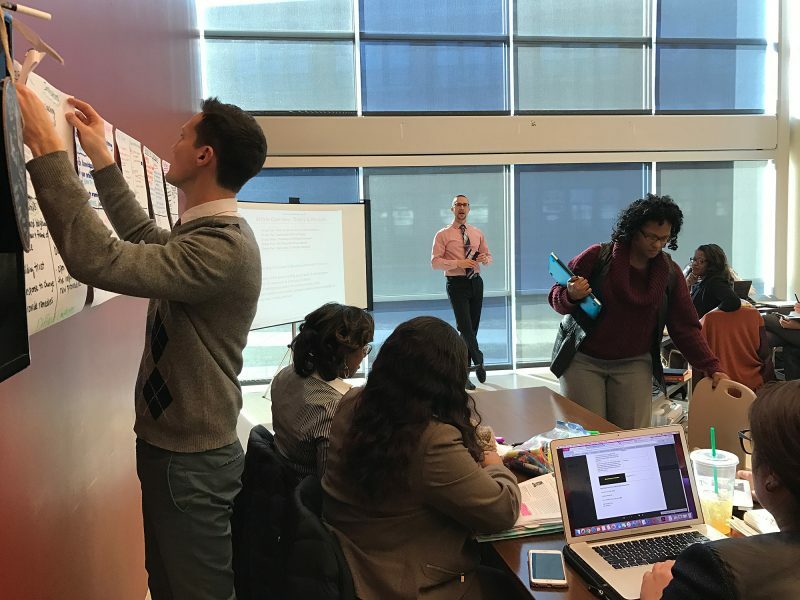 “Candidates might be surprised when we’re asking them about the role of shift manager at the cafeteria in their university, but that’s information we think can be extremely relevant,” said Sean Waldheim, Teach For America’s vice president of admissions. Like New Leaders, Teach For America focuses on certain qualities they want each of their corps members to exhibit. The key to ensuring that every candidate receives a fair evaluation, Waldheim said, lies in recognizing that those qualities, such as setting goals and successfully pursuing them, can be demonstrated any number of ways. Context is also important, he said. When looking at a candidate’s grade point average, for example, it’s important to know if that student was working 30 hours a week on top of their course load. And while Waldheim insists that TFA never formally launched a brand-new recruitment strategy and instead just shifted its interview practice, the results of that shift are significant. The 2016 corps was 51 percent people of color, up from just 29 percent in 2006, according to TFA spokesperson Danielle Montoya. TFA’s percentage of former Pell Grant recipients, an indicator of low family income, swelled to 48 percent in 2016 from 21 percent in 2007. Teach For America begins recruiting new teachers in their senior year of college or after they have already graduated. But some researchers say it is critical to reach out to a diverse cohort of students before college to open their minds to the possibility of a career in education. 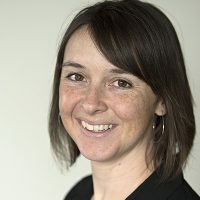 The idea is to create “a grow-your-own framework,” said Jafeth Sanchez, an assistant professor of education at the University of Nevada, Reno, who studies the development of effective school leaders. Related: Can schools create gifted students? Sanchez is particularly proud of the 17-year-old Dean’s Future Scholars program at her university, which focuses on encouraging future teachers as early as middle school. The program’s goal is to work with students from low-income families to help them become first-generation college graduates intent on pursuing jobs in education. Students are selected by teachers and invited, with their families, to attend sessions on getting into college. Interested students then take part in summer programs hosted by Reno’s College of Education, are paired with college-age mentors and are offered tuition support once they enroll in college, among other benefits. Like New Leaders and Teach For America, Dean’s Future Scholars is small. It is currently serving 500 students in grades 6-12, according to Mariluz Garcia, the program’s director. So far there are seven K-12 teachers, a counselor and 13 people with jobs in higher education among the alums. Another 19 are currently pursuing degrees in early education, K-12 education or school counseling. 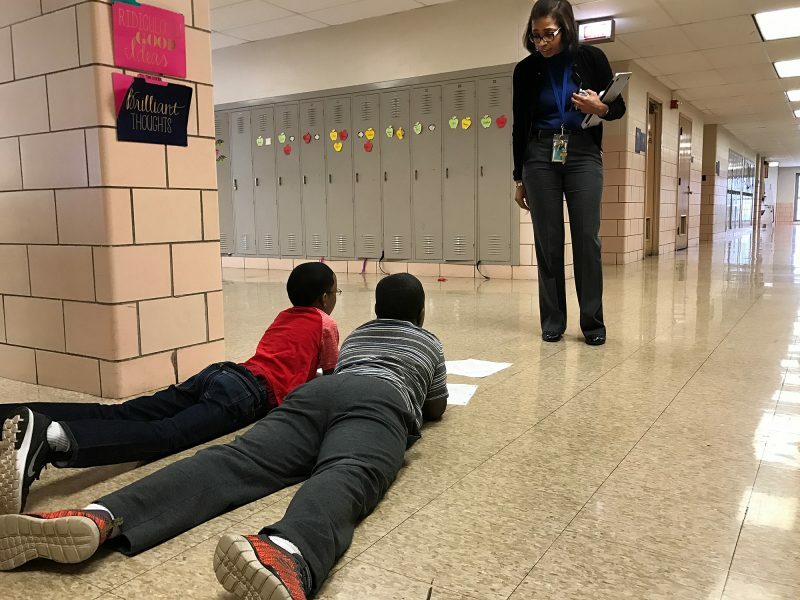 Back in Chicago, Principal King-Morris is keenly aware of her role as a developer of talent among teachers on her staff. “It’s my job to get to know them and to find out what their strengths are,” she said. King-Morris pointed to the school’s physical education teacher, Ibrahim Mouzaoui, who has re-scripted his lessons to make it possible to include disabled students and typically abled students in the same class. The extremely tall man, always willing to kneel to talk to students, takes his work so seriously that he has banned “gym class” from the school’s lexicon. Mouzaoui’s commitment to offering a physical education course that goes well beyond a few dodge ball games impresses King-Morris. She recommended him for a district-wide task force on improving physical education in Chicago. King was a veteran teacher at Dumas Elementary when King-Morris became the principal there in 2007. King was initially skeptical of the “kid that’s about to take over our school.” But the new principal, then in her mid-thirties, won King over by listening and never asking something of teachers that she wasn’t willing to do herself. When she wanted King to earn a certification for teaching English language learners, for instance, King-Morris earned the certification at the same time. When she wanted King to earn a certification for teaching gifted students, King-Morris signed up for that course too. King still works with struggling readers, but now, at King-Morris’ urging, she also helps coach new teachers to do the same. “There’s really not any words to say how much [King-Morris] means to me as far as helping me grow as a leader and a teacher,” King said. King-Morris does not see her race, or the race of any of her staff members, many of whom are white, as the key to helping students. Yet, at the same time, the children of Courtenay do have the opportunity to see their own racial diversity reflected back to them by their school’s staff, teachers and leadership. Even if the message that you can be in charge no matter what you look like is subtle, it exists here. Janiyah Harris, age 9, didn’t mention race when talking about King-Morris. 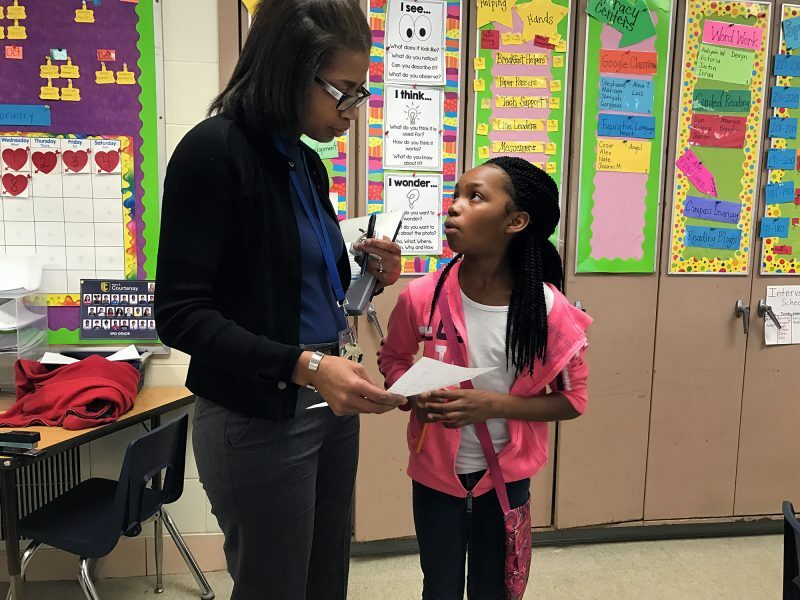 Rather, the bright third-grader, who is also black, talked about the expectations King-Morris sets for her and her classmates: “She gives us rules like: Be respectful, responsible and safe,” Janiyah told a visitor. Janiyah is in the gifted class and finished her work early enough to help a fellow student polish a skyscraper speech. Clearly a leader already, Janiyah could aspire to be anything. But when asked how she pictures her future, Janiyah said she sees herself becoming a teacher. Will high school segregation for refugees lead to better integration? What’s wrong with white teachers? Isn’t desegregation a measure of educational quality? Not only do we need more principals of color to lead schools in all communities (not just diverse ones), we need to develop leaders with the skills and intent to dismantle the dis-equitable structures and practices prevalent in our current educational paradigm. In other words we need not just principals or color but innovating principals of color. Why would black teachers be drawn to work and lead in schools that marginalize black and brown students through tracking, mis-identifying as special needs, over-punishing, and culturally insensitive pedagogy? Big Picture Learning is launching a new principal incubator in Washington state that hopes to address this need by recruiting leaders of color into a year-long design program (with an option to receive a principal credential through an accredited university partner), where they can develop the schools they want to lead while interning in and being mentored by the leaders of innovative public schools.